This post was sponsored by Kettle Brand, makers of THE BEST potato chips! One of my favorite things to do with Erlend is stay in, watch a movie, and share a bowl of Kettle Brand Sea Salt and Vinegar Potato Chips. We've literally been doing that every Friday night for the last five years, no joke. So I'm excited to find a way to use their products in my recipes! As always, all thoughts and opinions are my own, and thank you for supporting Hummingbird High and my awesome sponsors! A few weeks ago, a new donut place opened up down the street from my house. It's one of Portland's most beloved donut shops, but between you and me, it's never been my favorite — their donuts are expensive (usually $4 a pop! ), dense and heavy, with flavors that are a little too cloyingly sweet or worse, bland. However, because of its good reputation, I always find myself giving them a second chance. I've spent the last week (and over $30, to boot) picking at fancy gourmet donuts I can't ever get myself to finish. A good donut should have flavors and toppings that should complement but don't overwhelm the classic bread-y flavor of a donut. 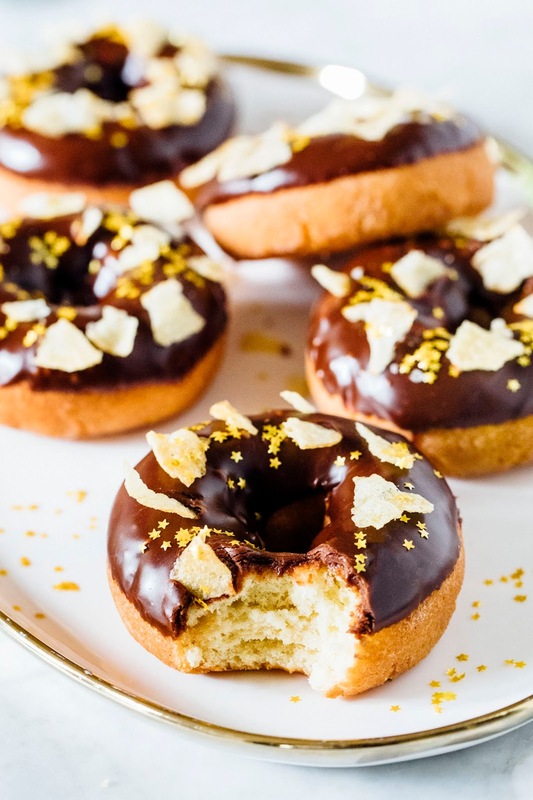 It should also light and fluffy, unless we're talking about cake donuts — these should have a texture similar to your favorite sour cream cake but with a crispier crumb. Truth be told, cake donuts are often trickier to nail than the already challenging yeasted donut. Most folks choose a shortcut by picking a beloved cupcake or muffin recipe and baking it in a donut pan — while I've done that in the past, it mostly just tastes like a ring-shaped cupcake and never results in the texture of the cake donuts you buy in donut shops. What gives! After digging around, I found a recipe for traditional cake donuts in an old cookbook specifically dedicated to the pastry itself. It turns out that cake donuts are made using a technique very similar to the one used when making crullers: the batter is put in a piping bag, piped into circles on parchment paper squares, and fried. While I was initially skeptical about the technique (it's much fussier than I would like), it does result in a true cake donut. In fact, when I brought these over to a friend's holiday party, people didn't believe they were homemade and insisted that I'd bought them at the new donut shop down the street! 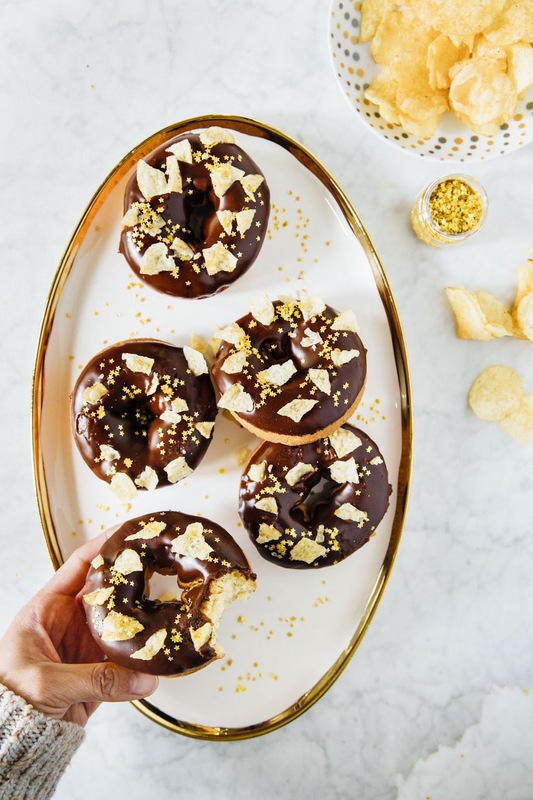 It was only after a quick Google search and confirmation that no, the bakery did NOT indeed make chocolate potato chip donuts, that my friends finally believed these were homemade. 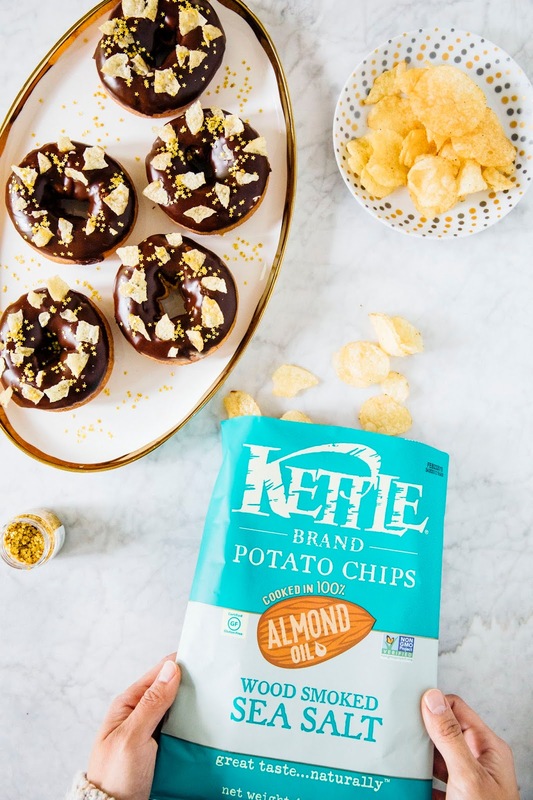 And between you and me, they're much better than anything you can buy there, with a deep, dark chocolate glaze complemented by the smokiness and a hint of almond flavor from Kettle Brand Almond Oil Wood Smoked Sea Salt Chips. If you're weirded out by the idea of using potato chips in a dessert, don't be! Think of potato chips as a way to cut through the richness of strong sweet flavors, similar to how flaky salt is often used in salted caramel desserts or chocolate chip cookies. They're the secret ingredient that your baked goods have been missing, I promise. I mentioned this in the post, but you will need to use a piping bag and the right tips in order to make the crullers of your dreams. I used the large round tip from this Ateco set, which I highly recommend as I use it for everything — in a pinch, you can use a Ziploc bag with the corner cut off (just make sure the hole is at least 1/3-inch wide). The process for making cake donuts is weird, and a little on the high maintenance side. Basically, you pipe a circle onto a square piece of parchment paper, let it fry for a bit, and then pull off the paper with a pair of tongs. There's no way around this — the paper helps keep the donuts' shape, and forgoing it will result in donut holes as opposed to donuts. They'd be just as tasty though, so go for it if that's your jam. These donuts are best the day they're made; letting them sit overnight will cause the potato chips to go soggy and lose their crisp. 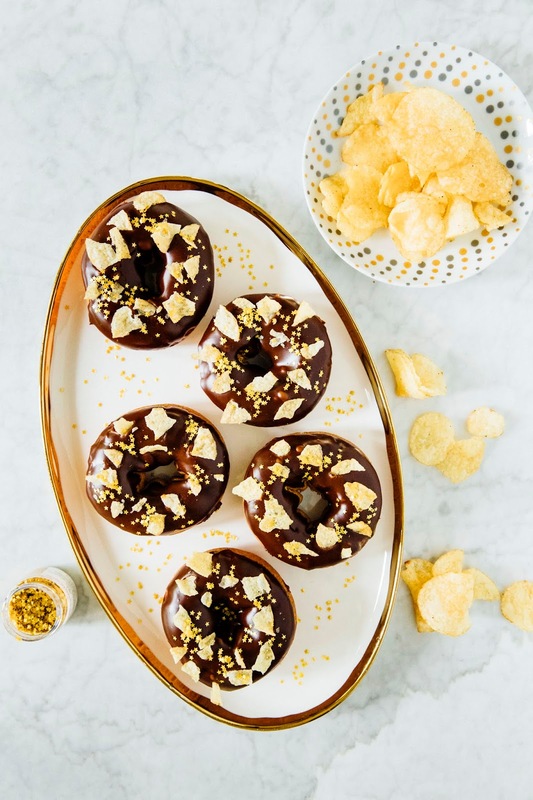 If you insist on making them ahead of time, don't garnish the donuts with potato chips until absolutely ready to serve. In the bowl of a freestanding electric mixer fitted with a paddle attachment, combine 2 cups all-purpose flour, 1/3 cup granulated sugar, 2 teaspoons baking powder, 1/2 teaspoon ground cinnamon, 1/2 teaspoon ground nutmeg, and 1/2 teaspoon kosher salt. Beat on medium-low speed for 30 seconds, or until well combined. With the mixture still on low speed, add 2 tablespoons unsalted butter and continue mixing until the mixture resembles coarse sand or cornmeal. In a liquid measuring cup, whisk together 1 large egg, 1/4 cup whole milk, 2 tablespoons sour cream, and 1 teaspoon pure vanilla extract until well combined. With the mixer running still on low speed, slowly pour the wet ingredients into the flour and butter mixture. Scrape down the sides of the bowl and continue mixing for around 30 seconds, just until the ingredients are combined. With the mixer still on low speed, slowly mix in the remaining 1/4 cup of milk, a tablespoon at a time, until the batter sticks to the sides of the bowl — you may not need all of the milk. Cover with plastic wrap and let rest for 20 minutes. While the batter is resting, prepare for frying. Take a rough 9 x 13-inch rectangle of parchment paper and use kitchen shears to cut at least ten 4 x 4-inch squares. Dip a pastry brush in a small ramekin of vegetable oil and lightly brush one side of each of the parchment paper squares; set aside. Nestle a candy or deep-fry thermometer to the side of a 4- or 5- quart cast iron pot; fill the pot with at least 3-inches of vegetable oil. Place over medium heat and cook until the temperature of the oil registers 360 (F). Prepare a wire rack by positioning it close to the pot and lining with paper towels. Once you've prepped your fry station and the batter has rested for at least 20 minutes, transfer the batter to a piping bag with a 1/3-inch round tip. Use the piping bag to pipe a 3-inch diameter ring on each prepared parchment paper square. Carefully place one of the circles of dough, paper-side up, into the hot oil. After a minute, use tongs and a sharp knife tip to gently peel the parchment off the cruller. When the donut turns golden (about 2 minutes), flip it over and let it fry for another 2 minutes before removing it to drain on the prepared wire rack. Repeat until all dough circles have been fried — depending on your deep frying vessel, you can probably fry up to 2 or 3 donuts at a time. Just make sure that your oil maintains its temperature at 360 (F) degrees. Cool to room temperature completely before glazing and eating. Place 1/3 cup Kettle Brand Almond Oil Wood Smoked Sea Salt Chips in a small Ziploc or sandwich bag. Use the base of a heavy mug or a rolling pin to gently crush the chips into smaller chunks, aiming for pieces that are the size of your pinkie nail. Set aside. In the bowl, combine 1 cups confectioners' sugar, 2 ounces semisweet chocolate, 3 tablespoons unsalted butter, 2 tablespoons water, and 3/4 teaspoon pure vanilla extract. Cook, stirring occasionally, until the chocolate and butter are completely melted, around 2 to 3 minutes. Remove from heat and stir until smooth and well blended. Line a baking sheet with parchment paper. Dip the donuts, top side down, into the glaze. 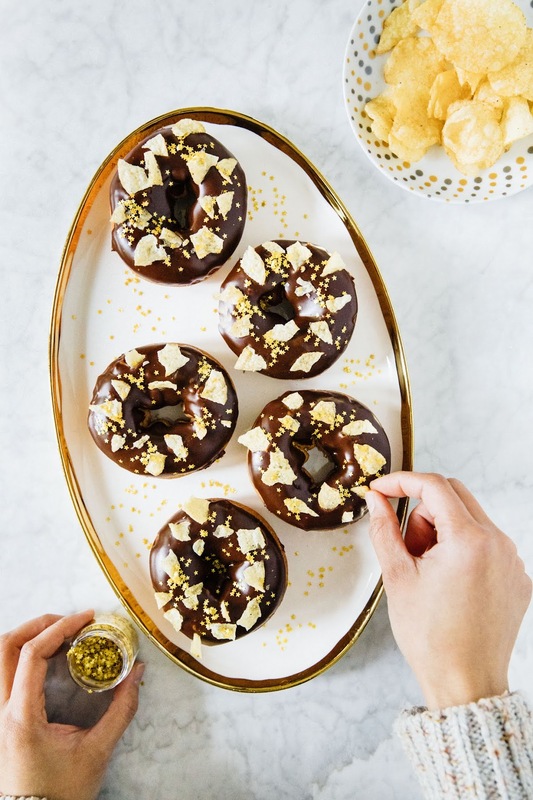 Place on the prepared baking sheet with the glazed side up, and immediately decorate with crushed Kettle Brand Almond Oil Wood Smoked Sea Salt Chips and edible gold star sprinkles. The donuts are best the day they're made. Enjoy!